Will your class escape in time? Try this escape room game with your students today! This is a fun game that is perfect for reviewing reading strategies, specifically summarizing and context clues. Students will be visiting different countries all over the world, and learning about their Christmas traditions. This game is intended for 3rd-5th grade students. This is an interactive game where the students are timed. They are trying to save Christmas by finding Santa’s lost toy bag. Students must solve a string of questions and clues, as well as decode different ciphers to escape. If your class has never played an escape game before, I suggest playing this as a whole class. However, materials are provided for up to 6 different groups to play at one time. Students try and solve clues and questions to breakout and escape the classroom. You, the teacher, can decide how much time your students have to complete the task. I suggest 60 minutes, but it is up to your discretion. You can even split the time up and play 30 minutes one day, and 30 minutes a second day. Also, you can project a timer for your class, or put one somewhere for all the students to see, so they can keep track of how much time they have left to complete their task. So fun! Can’t wait to do it again next year. Great activity for the week before Winter Break! Thank you. Did this the day before winter break. My kids loved it. Thanks for all the work I hope to use this, this year. This was such a fun activity to do on the last day of school before Christmas break! Although there was A LOT of prep work and organization needed, it was well worth it to see the fun the kids were having. I love these escape rooms! This was a great activity for 6th grade! Thanks for making this! My students had a great time while learning about Christmas in other countries. Nice way to combine skills into the crazy holiday season! Great activity. My students loved it. My students enjoyed this activity! My students were so excited to use this resource! Thank you! Very fun, but sooooo much prep work. Students really enjoyed activity. Prep for activity was longer then I expected. SO fun ! A lot of prep to put together but so worth it ! My students had so much fun completing this challenge on the day before winter break! They love escape rooms! They love Christmas! Great way to keep them learning! Another great product! This will help fill those last few days before winter break. I love that it is engaging and educational! The kids loved this. Thank you. This was so much fun! And perfect for the day before Christmas break! The kids LOVED this! I will definitely be purchasing more. Great way for us to wrap up our unit about Christmas Around the World! I needed something for the week before Christmas but I needed something worthwhile. This was great. It takes time to put together but my students really enjoyed it! This is such a fun activity! My students really enjoyed this activity. Loved this for Christmas time! Great fun and student were engaged. Thank you! This was our first Crack the Code. We did not finish the first day but as soon as they walked in the door the next day they asked if we could keep working on it. Thanks! This was a lot of work, but totally worth it. The kids loved it. My kids and I loved doing this activity before Christmas break! So much fun! I loved the unit I bought for Halloween. However I really struggled with this one. I had an extremely hard time getting it ready, honestly could have just been me, and my kids not one in any grade from 3-6th was able to complete this. But I know it can be done and next year I plan on working on the skills and doing some practice before this so my students can do this fun unit. It was fun to do with the kids. What a great way to combine teamwork, collaboration, problem solving, AND content! My students were able to learn about holidays around the world in a very engaging way!! I absolutely love your products!! Looks like another activity that my kids are going to love! My students had so much fun with this! Great way for kids to learn about other cultures. We had a lot of fun using this at Christmas time! This was so much fun! Thanks for a great resource! A little time consuming to put together, but the students love it. I look forward to using this. Thank you for this resource. Looking forward to making this next year. Fun right before the holidays. Can easily adapt text passages to differentiate. Great activity! I plan on buying more of them! My students are going to be so excited to use this. AMAZING! My students had so much fun cracking the code! I can’t wait to try another. It was a lot to prepare but so worth it. My kids loved it! This is a great resource! My students really enjoyed it. It took a little longer than I had anticipated, but the students worked hard. It was more prep work than I had anticipated, but I laminated for future use so that helps! My student’s absolutely loved working on this escape room. My students loved working through this escape room! Highly engaging! Students loved it! My kids had so much fun!! They worked hard and showed great teamwork. Great activity for right before break! My students really enjoyed this! This was a fun and challenging activity to do with my students before winter break. This kept us working hard the day before Christmas break! Outstanding!! We used this for our Christmas party and the kids loved it!! What a fun activity before winter break! My students loved playing this game. This clues were challenging enough, yet not too complicated for them to complete with very little teacher assistance. Didn’t get to use, looking forward to using it next year! My students had an absolute blast completing this! Thank you so much! Can’t wait to use this! It looks great! The kids loved this. It was just challenging enough to keep them occupied! Thanks so much! Came in so handy during the Holiday season. I used this with my 5th grade class throughout December, so much fun! Highly recommend! This was great! Can’t wait to use it next year too. Thank you for your work! It looks amazing. I am looking forward to trying it! Thank you! My students LOVE this resource! They can’t get enough of them. Sadly did not get to use it this year, but will definitely use next year!! Amazing and super fun for the kiddos! This sounds like a fun and engaging activity. Thank you. This was super fun! We did as a whole class since my students had never done one before, and they loved it! My students enjoyed this escape room activity. My students loved it, even though they had to think! My kids LOVED this lesson! It was a great lesson/activity to promote teamwork, collaboration while synthesizing new information about how diverse cultures celebrate the holiday. It was very time consuming to prepare and plan and we had kinks to work out along the way but well worth it!!! This was a great activity for right before break! The kids enjoyed it! So much fun before Christmas break! We loved this activity!! We ended up spreading it all through the school and the kids had so much fun! It was a great way to send the kids off on break. My sixth graders loved it! My class LOVED doing this as part of our Christmas party. Thank you! I absolutely love this. Thank you for providing such a fun, rigorous task for my students! My students loved this! This will definitely be something I use every year! Can’t wait to try this with my class! This activity was so much fun! My students enjoyed every minute! My kiddos love these! This is my third one and love the problem solving that is happening in my room! Thanks for creating this resource. It was a fun activity prior to the holiday break! So easy to use and the kids had the best time playing. My students had so much fun participating in this activity! This was so fun! The kids loved it! Thanks! The perfect activity right before our Holiday Break. Great product. Perfect for classes with students at varying levels! Cannot wait to try more. I loved the idea behind this challenge, and my kids were appropriately challenged as well. I learned that many weren’t reading directions, which opened my eyes to the need we had as a class in that area! 🙂 Fun for before break! This resource motivated and engaged all of my students! My grade 6/7 class LOVED this! Fantastic resource. Will use again next year! Keeps kids engaged during the squirreliest time of the year! My students LOVED this escape the room! Very detailed directions for the teacher. Highly Recommended! My class loves escape room themed activities. This was engaging and informative. It left my students curious and wanting to know more about different cultures and customs. A great tool for both ELA and SS… Thank you! There is a lot of set up so I did not have time to try it this year. Hopefully next year. Wasn’t able to use it this year, but looks awesome! Amazing activity…I used this the day before winter break my students absolutely LOVED IT!! Class loves these. They get so competitive. Students love working together to complete these activities. My students loved doing this! Thank you! My students had a lot of fund with this! this kept the kids super engaged. Fun activiity for fifth grade before Winter Break. Love your resources! You make learning fun! Thank you, my students enjoyed it! This was fun! It was a little too challenging for the small groups in my 6th grade pull-out support class. Next year, I will do this activity as a whole class so I can better facilitate. My students really enjoyed doing this activity. Thank you! I have done a few EDU Breakouts with my class. This was the first Escape Room and wondered how well my students would do with it. They were very engaged and had a great time. Thanks, I will be purchasing more. I can’t wait to use this resource in my classroom. My students loved this! Can’t wait to do another one soon! Lots of fun for students and a great activity to do during December. Thank you! This was a FUN and informative activity! I loved this! Even though this was a little challenging for my third graders, it was AWESOME! This was very challenging for my 4th graders, but they loved it. I can’t wait to try more of these. A little tricky for third graders, but it worked for a whole-group activity! Super Cool!!! My students had A LOT of fun!!! My students loved this! (There were 2 capitalization errors though – they made sure to point them out lol). Thank you! My kids loved this activity. They didn’t even realize they were actually learning the week before Christmas break! Very well organized and the directions were explicit and easy to follow. This was so much fun for my students! 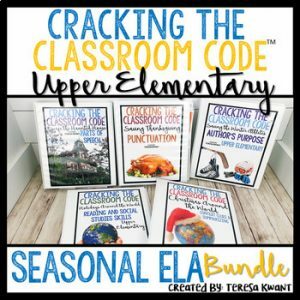 I cannot wait to purchase more Cracking the Classroom Code resources! Thank you! My kids had so much fun doing this! Thanks! My class had the best time playing this game before Christmas Break! They keep asking for more! My students thoroughly enjoyed this! Can’t wait to do it again! Excellent resource. Some of my kiddos helped me create the materials for each group. I am curious – since I teach 4 different classes – any suggestions for a quick turn around to set up the clues for the next classes? My class loved doing this. I did not get a chance to do this this year, however, so excited to get it all ready and do this next year. I know my students will LOVE it! Thank you! Fun, but a little easy for the grades listed. I teach 6th. I purchased this one, not realizing there was a lower elementary version. However, it will be great if I ever teacher older grades! Students were engaged and excited to work through the escape room! I really liked the different colors provided in this activity and it was great for my students to be engaged in learning the day before Christmas break! Loved it! My students really enjoyed this activity. It was great to keep them engaged before Christmas break. My students love these activities! This is another great interactive lesson! WOW! This was so much fun! It was pretty difficult for my 3rd graders but an excellent challenge! I hope to do another one this year! The prep for this was a little intensive since I chose to have my 5th graders complete this escape game in small groups. However, it was worth the time spent. They loved racing against one another, and were SO engaged. Once I got the hang of setting it up, the rest of the prep was pretty easy. My kids had a blast, and it forced them to really work as a team. (Social skills!) I love that there are so many ELA concepts to choose from too! I’ll definitely be coming back to snag some more of these Escape games. 🙂 Thank you! This was so fun for my kids! They loved it! My students adore cracking the code. Thanks for providing such an engaging way to teach standards! My students loved this, and they had so much fun! Another fantastic Escape Room. My class begs to do more of these. I now own and have built 16 of them! This was a fun and beneficial activity for my students to participate in before the winter break. The volume of reading passages was a little high for my lower learners, but overall it was a fun activity. I LOVE this…. but…. it’s a l-o-t of prep (the author is very clear about this as well). It also takes clear explanations with younger elementary students (3rd graders), but after you do it once, it’s smooth sailing and the kids LOVE it! It’s great for wrapping up a unit! Such a fun resource! Thank you. This was a great activity right before break. Thank you! Used this with my class before Christmas break. They were engaged and enjoyed it very much. This was fun and creative, and saved me a ton of prep time doing a Breakout Box in our fourth grade classroom! Great activities to do the few days before Winter Break. My students absolutely loved this! It was easy to put together and so fun! There was a lot of prep work but my students loved it. Great activity. Lots of fun! We love these activities in our class! Great challenge with a fun topic! Can’t wait to incorporate this into my Christmas around the world unit next year! My students loved doing this activity. Helped keep them engaged and focused right before break! This was such an awesome activity!!! My students loved it. 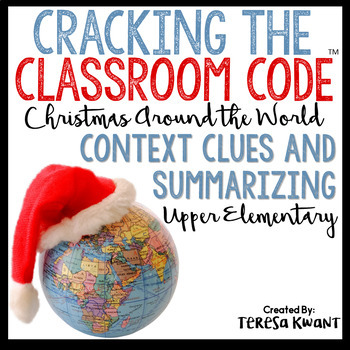 I will definitely be looking into other “Cracking the Classroom Code” activities. Thanks so much!! Man this is such a great series of products. So fun and engaging and the best part is, it helps students to solidify their knowledge of other countries! It really draws the information they’ve learned out of them. Very creative and challenging. Thank you! My kids enjoyed doing this activity. It was definately a challenging activity for my 5th grade students, but a great way to wrap up our “Holiday Celebrations”. This looked like a fun activity. I got sick the week I was planning on using it and didn’t want to leave for a sub. I will definitely be using this next year and I am looking into the other activities offered. We love all of your Escape Rooms! My students are always asking for more! kids loved it! We learned a loT!! This was A LOT of work to put together, and actually takes a really long time to do the activity. We were unable to finish even with an hour’s time. That said, my kids were SO engaged and really loved it! I wish I had had more time for it, and will provide more time when I do it again next year. This is a great product! It did take a while to put together and I didn’t do a very good job of teaching it, but I’m looking forward to doing it again next year. One of my challenges was since we did this whole group, I didn’t have enough ciphers made so multiple students in the classroom could be working to crack the code. Next time, I’ll have extras so everyone is actively engaged in that part. Teaching is often about learning for the teacher too. My students were highly engaged and had such a great time. Looks like a lot of prep work, but hopefully worth it! My students had so much fun with this. Great activity to keep their attention the week before winter break. The class loved this and we did it the day before leaving for Winter Break. Great way to keep them energized and busy working! Easy to prep too! Affordable and a blast! Thanks!! Fun, engaging activity! Thank you! Awesome addition to our activities for Christmas Around the World. Had to alter it for my lower students but it went fairly well. We had a BLAST doing this! Very detailed and complete. Thank goodness for the pictures for set up! Kids really liked. Lots of set-up and prep time, but the kids absolutely LOVED it! My classroom absolutely loved this activity! Thank you! I loved this product and so did the students! The setup directions were so helpful and the kids loved completing the activity! I didn’t get a chance to use this, but the quality is superb! I will definitely use it next year. This resource was great. My students really enjoyed it. Great resource for those hectic last days before holiday break! My students really enjoyed this. These puzzles are so worth $4.00. My classroom loves them and we have done at least 4 so far this year. If I have time to get them in I do…you’ve made me a “fun” teacher! Material and skill practice are right on for my 4th graders. I didn’t put this together in time to use this year, but will plan better next year! Thank you for this, my class had so much fun trying to crack the code! My students loved this as one of our Christmas activities! So much fun and engaging! Thanks! Students struggled with this activity, but it was a good thing. They had to work hard and collaborate with their classmates. Once they were able to solve the first envelope they were hooked and engaged. I can tell many hours were spent making this product. Thank you!! Students absolutely loved this activity! I don’t think they realized they were learning and practicing skills! Lots of work to set this up, but the kids LOVED it! My students absolutely LOVE your escape rooms! Loved this!! We did this as a whole class! I have it ready to go for next year. I made multiple copies of the decoders to engage all the students. I am planning on buying another unit!! Great activity for multiple grades to use the day before vacation. 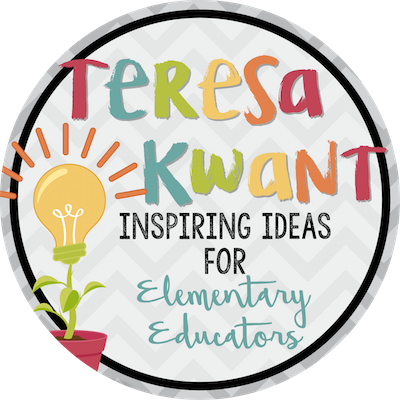 This is a wonderful resource….There was so much provided that I will have to wait until next year so that I can get it all ready … LOTS of work went into this. My kids LOVED this! It took quite a bit of prep on my part but totally worth how much they enjoyed it. I will do more but use the summer to prep them. Great resource!!! Very challenging! Kids loved it. Excited to use next year, did not find an get this ready in time this year. Students really enjoyed this resource! Really great product – I appreciate all the work that was put into it and it taught my students a good lesson on what happens when you do not cooperate with your teammates! 🙂 I wish that the summarizing tasks had something to do with actually cracking the code, though. Thanks for the resource to help with the holiday restlessness. Another great resource that my kids loved. Thank you for sharing your work. My class loves these! I teach 4th grade and it takes us about 2 hours to complete one escape room in small groups. Great motivator and the kids really enjoy it! My 4th graders loved this! Great resource and activity for the week before break. The kids had so much fun. A lot of prep work, but totally worth the effort. Lots of fun, but we didn’t escape in time! Great activity in problem solving! All sorts of great resources! Will be using during the holiday session! Thanks! Amazing, my students LOVED this. It was high interest and engaging for all. This was a really fun activity! It was the first Crack the Code I’ve ever done. It took awhile to set up, but was worth the time. It took my class almost an hour and a half to complete, but I think that was because I have a class of 3rd-4th graders, so they were on the younger end and it was our first one. I would definitely recommend it, the kids enjoyed it. WOW, what an awesome activity for my 5th graders!! I do have a question about the printing, do you have any suggestions as to why when I print it out the bottom gets cut off a little every time? Thanks! I can’t wait to see this in action! This is the perfect activity to do with my 4th graders right before winter break!! Holy Moley… This is too cute! I am using with the ELLs and it is a perfect way to teach holidays around the world for this age group. My class loved this!!! It took a bit to set everything up, but it was well worth it! Very thorough and engaging! A fabulous way to teach this concept! Give yourself a few days to get everything printed, laminated, and prepared. It takes a little bit of time, but is completely worth every single penny. My students thoroughly enjoyed chasing down Santa’s lost toy bag. It was fun, engaging, and kept the students focused in the last few days before Christmas break! Excellent product. I am excited to do this activity with my student thins next week! Thank you for creating this! LOVE! This is the second Escape Room I’ve bought from this author! Excellent! I’m looking forward to using this with my class next week! My kiddos have just finished working on this. They were so engaged!! They’ve never done anything like this before so there were some teething problems, but they soon got the hang of it. Great directions! Students loved it! Super easy to follow, thank you! Can’t wait to use this!! The step-by-step instructions were the most helpful, so I could get everything in order. I love that it is engaging and standards-based! This is an excellent resource! Thank you! Wonderful product! My students loved it! Excited to use this game the day before we get out. I bet it will keep them engaged! This is really well organized and well done! I appreciate the clear pictures and directions. We had so much fun with this! Can’t wait to do math! Wow! What a great value for such an intense activity! Thank you for creating this. I look forward to using this with my students. My kids loved doing this project! Seems really fun. I can’t wait to use this, especially during the crazy Christmas time. I am so excited to have an alternative to Christmas around the world! Excited about using this! Thank you! I love all of your products. Thank you so much! My students have completed the math escape room activities and had such a good time with it. I can’t wait to use this one. Another wonderful resource! My students love solving puzzles and cracking the code. It makes learning so much fun for them! Finished getting it put together and ready yesterday! Excited to use this with my students next week! Thank you! I can’t wait to use this with my kiddos before Christmas! They are going to love it!! I can’t wait to use this product. My kids are going to love it! Can’t wait to use this with my kids! Great directions on how to set up activity. These are really helping! Thankyou!!! I’m prepping this now and am very pleased with it. I am sure my grade 4 class will love this activity. I really enjoy doing escape rooms in my classroom. This connects to standards, teaches diversity of the holidays, is VERY reasonably priced and looks like a lot of fun. I can’t wait to try it! I can’t wait to use this as a final activity for my Christmas/Holiday’s Around the World unit! This will make a nice alternative to our holiday reading packets. I have this on our calendar for the Friday before Winter Break! I love the step by step instructions with pictures. It made for easy setup. I have multiple of these activities and my students and I LOVE them! It is a lot of prep but the student engagement makes it SO worth it! Great resource. Can’t wait to use it with my students. Looking forward to using this as a culminating activity for a Holiday Around the World unit. I have used the beginning of the year Escape Room challenges as well as few of the math so far and my students love them! This will be a big hit! My students love these activities! Thank you for making these wonderful resources! I’m excited to use this with my class next week! Looking forward to using this with my class, I know they will really enjoy the activity! I can’t wait until we do this! They are so fun! Thank you! So excited to use this!!! What a fun way to practice Language Arts skills. Thank you for taking the time to create this activity. I have not been disappointed! This is a fun, well put together activity! love this and can not wait to use it! Thank you! I researched through quite a few of the different “escape room” activities, and I finally decided to purchase this one, because it looked the most detailed and helpful. I’m looking forward to using this resource. Excited to use this before Christmas break. My kids loved the back to school one! Thanks! Amazing! This is just what I needed to change up our Holidays around the world unit. Thank you! Can’t wait to use! This looks great-can’t wait to use it! We just finished up the Pirate escape room and I can’t wait to do this one next week with my kids, these are great! Will be using the last week before Christmas! Looks like an amazing adventure, can’t wait to try it for the holidays! What a fun activity to do during the last week before Christmas Break. I am so excited to do this with my class this year! Thanks for putting this together! Wonderful!! I saved ink and only printed the last few pages. Great activity for the coming holiday weeks. Cant wait to use with my students. So excited. Can’t wait to use it! Thanks! Can’t wait to use this one. My students loved your Thanksgiving Escape the Room! I can’t wait to use this with my 5th graders! Great way to get the kids involved. Thank you! I am so excited to use this in my room! This is a huge bundle! I can’t wait to get started. Can’t wait to use this with my students! Great resource! Can’t wait to use it! My kids really love these. Have bought several. Love using these! Very engaging! My students love these activities – can’t wait to use in the next couple of weeks. Thanks so much! A great addition to our holiday traditions unit. So excited to try my first escape room! I love how organized this packet is to help provide some holiday fun! Cannot wait to implement this. Will be a definite change from what I’ve done in the past which is a good thing! Keeps my kids guessing if they will do what a sibling has done. Thanks so much. I’m super excited about doing this with my class. Thank you! So excited to use this! I have the Crack the Code bundle for math. My students love it! When I saw this – I knew it would be the perfect addition to our Christmas Around the World unit. Thanks! So excited to use this product. It will be awesome review and fun right before our holiday break. This is going to be so much fun the week before Christmas! I can’t wait to use it! Love this! Can’t wait to use it with my class! Love this! Can’t wait to use! My kids are loving this!! My kids love these activities! Can’t wait to do this with my students after our Celebrations Around the World day! We just did our first break out room activity yesterday and it was a hit! They were begging for more. I can’t wait for my students to do this one! Thank you so much. I have so many of these and I buy every 5th grade one. My students love this and I am always checking each day to see if you have added any more. Keep them coming. Thank you for sharing your work! I am looking forward to using this in December. I can’t wait to use this during the holidays. These are a ton of fun! Thanks for such a unique and creative activity! My kids beg to do these now! They love them all! I am loving these ELA holiday themed games! Thanks!